January is always a month of reflection, a time for considering the achievements of the previous year and the hopes or ambitions for the one to come. It’s awash with resolutions, promises and dreams, of what might be, a perfect moment in time to recognise what makes us happy. For some that would be to start again, to get away from it all and begin afresh without the cares or worries we have now. To escape the hustle and bustle, and commit to something new and interesting, in a place where you’ll have purpose, be respected and enjoy life. Sounds perfect, right? My Time at Portia, then, could just be the very thing you’re looking for to beat the January Blues. 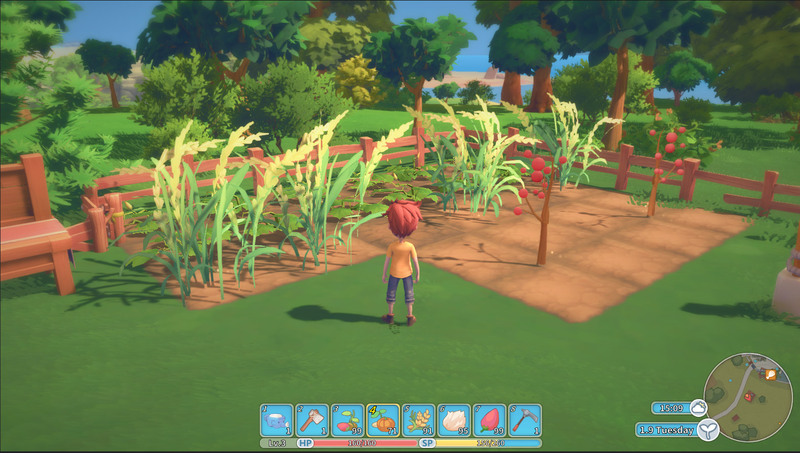 My Time at Portia is a bright and vibrant simulation RPG where you become the latest resident of the titular town and take over your dad’s crafting workshop on the outskirts. You begin your life integrating into the laid-back way of life of the residents, and have been drafted in as one of a few of the town’s builders. Your task is to help out by way of fulfilling building commissions to help expand Portia’s horizons and make life for the denizens just that little bit easier. The game itself has actually been out on Steam Early Access for the best part of a year, and the first thing that will become crystal clear to you is that those early adopters may have the benefit of actually seeing most of what it has to offer by having had a year’s head start. 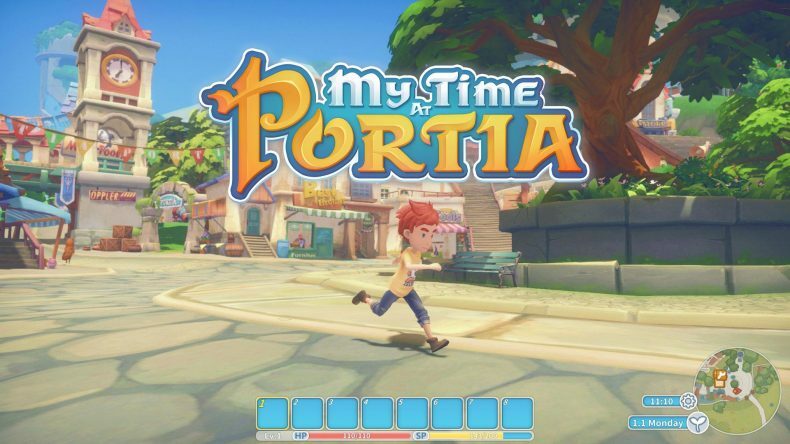 Yes, My Time at Portia is a big game in terms of content and thus the potential hours you could sink into it, and it makes no apologies for it. Indeed, a title where there is an annual calendar of events presented to you at the start, in which you choose your own birthday, should be your first clue of the developers’ idea of scale. The realisation that each month takes at least 10 hours of real time to play through depending on what you do should be your very blunt second clue. But we’ve all been here before with the likes of Stardew Valley, and it’s proof that with the right setting and gameplay design, such a packed agenda can still feel engaging and accessible. So how does My Time at Portia fare in comparison? Well, the move to a 3D world certainly helps with the immersion and engagement as you run around the town and surrounding environment going about your business. Whether it’s milling around your workshop overseeing your latest construction, or going out in the wild and chopping down trees or mining minerals off the land, you feel a part of the world, and the world itself feels real – if we ignore the magic periodical replenishment of trees and rocks to prevent you from ever truly running out of anything. And the world itself feels alive, too, not least the many denizens of Portia going about their daily lives. Much like the inhabitants of Clock Town in Majora’s Mask, you’ll find yourself aware of their individual routines and patterns, so you can track them down when you want to, and begin to forge relationships with them. Unlike Majora’s Mask, though, there’s not a foreboding moon above you threatening to crash down and cause Armageddon. However a cursory glance upwards (and indeed around) will still cause a stir of unrest within you as towering, decrepit ruins dot the landscape in and around the otherwise peaceful suburbia, and you realise something strange has happened here – these are relics of a forgotten past, hints of a backstory with more to it than initially meets the eye. And the same can be said of Portia’s gameplay. Whilst the story is fairly simple in that you complete commissions to earn respect and adoration, and then move onto the next, more complicated one, that’s only part of it. To progress you may need to partake in some fishing, go deep into a mine to seek out rare treasures of the past, research new technologies, upgrade your equipment to afford you more construction options, maybe even tackling some dangerous enemies hidden away in an abandoned area. All this for the pursuit of technological progress. And that’s before you even consider growing crops, raising animals, befriending the locals and building your relationships with them or doing them favours. There might be a martial arts tournament to get involved in or a fishing tournament, or a ghost walk to complete. The fact is there’s so much to do in My Time in Portia that it can often seem overwhelming. Perhaps the game’s biggest problem is that it rarely does anything to help you in this area. Whilst it make no apologies for being a sprawling simulation with plenty to do, it also doesn’t feel the need to offer a helping hand or advice about what to do next. Yes, there are tips on loading screens but none of it suggests any priority over any other advice, and so it all comes across as background noise. So in practice, there were numerous times where I was ready to move onto the next commission to progress the story, only to discover that not only did I not have the right materials, but I didn’t even have the right machinery to make it, and I would have to spend a lot of in-game days researching just so to unlock a new machine or two. And remember this was just to build machines that would give me the ability to start making the resources I needed to even start that next commission. Phew. And yet, whilst that all sounds exhausting, I persevered, and found myself utterly enjoying myself. Because once you take a step back and realise there’s no pressure to complete story missions, and you understand the mechanics enough to know what the priorities are, you can sort of fall into a lovely charming rhythm where you could simultaneously be juggling goals both big and small and finding joy and happiness in all the little things on offer here. It’s a title I fully recommend using a guide or two to help with, just because there’s so much to know and understand that discovering it all for yourself would be too much for many. But a handy reference point, only when you absolutely need it to maintain your immersion in the experience, helps a great deal and can easily be found online. 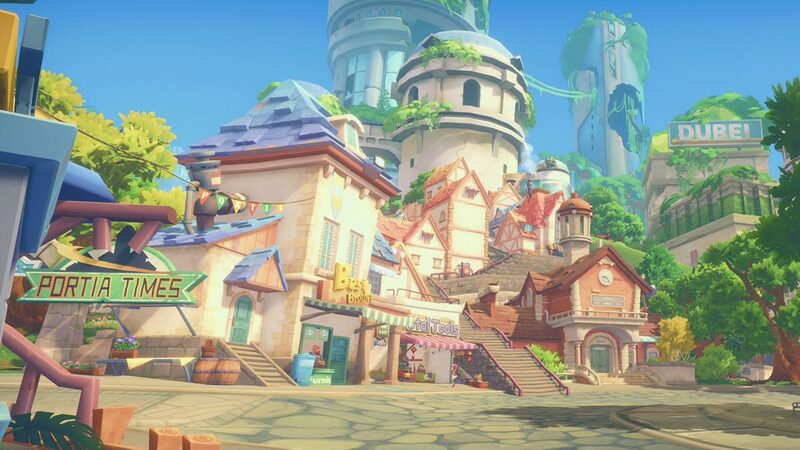 Fundamentally, I enjoyed My Time at Portia because, well, I enjoyed my time at Portia. It sounds like such an obvious line, but it was so true to my experience. The town and its surrounding areas are full of charm, character and life, as well as a smidge of intrigue and mystery concerning its past. There are so many mechanics and intricacies for you to get under the skin of and understand, and you’ll feel even after 40 hours of play that you’re still progressing bit by bit and learning and becoming a better builder for the town. Yes, the pacing is slower than, say, Stardew Valley in places, and the nature of some of the mechanics mean you can’t proceed with story missions as quickly as you might like, but because there’s so much to occupy your time in the interim, you’ll blink and an in-game month has passed, and you won’t care. For this genre to work, it has to grab you and draw you in to its world, and make you want to see what’s next and My Time at Portia delivers this in droves. If you’re looking a fun, fresh simulation title, and are prepared to put in the time, this is well worth your attention. I’ll definitely be returning to Portia when I can, and that’s a resolution I know I’ll stick to. 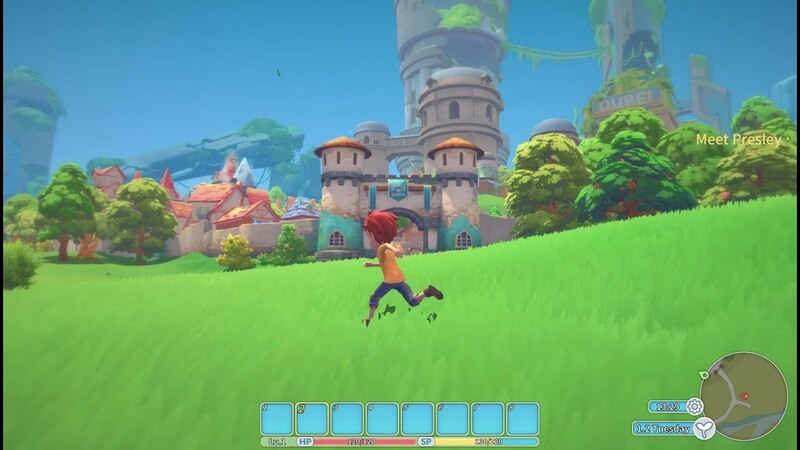 If you're prepared to learn a lot, and have plenty of time to spare, My Time at Portia is very enjoyable. Sporadic use of a guide will allow you to experience it in the fun, relaxed way it was intended.